Includes one handle, two bolts and two washers. Select a length. TIP: Unless you already have plates to use with these, you aren't saving any money by building your own dumbbells. Get our pre-assembled Troy Pro Style Dumbbells instead. Drop-forged from one piece of steel with extra-long, fine-thread bolts for secure locking. This is a straight and knurled handle, not a contoured grip. Each handle includes a pair of large washers. These can either be assembled with the washers on the ends or you can toss the washers and use the larger end caps (sold separately). The end caps surround the bolt and result in a smooth end that is more comfortable to the user, for example when resting them on the thighs to set up for seated presses. If you are replacing the handles for your existing dumbbells, we recommend replacing these in pairs to ensure that each pair of dumbbells matches. Brands may differ in style. These are made by USA Sports/Troy, but they are not exactly the same as the handles included with the pre-assembled Troy pro-style dumbbells, and you will not likely to be able to get those pre-assembled dumbbells loose anyway. Each handle is of a length to fit an exact number of standard weight plates. The #1 handle will hold 1 plate per side, the #2 will hold 2 plates per side, and so on. 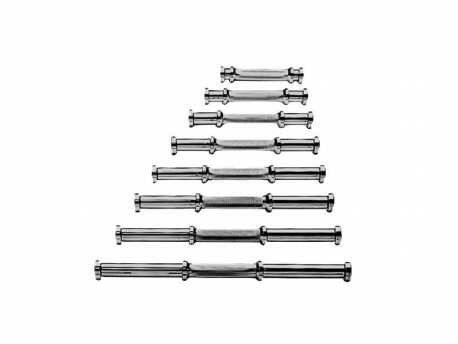 They are tightened with a bolt (you will need a 5/8" allen wrench) and are meant to be semi-permanently assembled and not meant to be adjusted frequently - See the Adjustable Dumbbells if you're looking for a pair to adjust weight constantly on through every workout. Refer to the list below for what size of dumbbell you can assemble with this handle. Each handle with two end caps is considered above to weigh about 5 lbs. Due to their different lengths, the #1 and #2 are slightly underweight, and the #3 to #8 are slightly overweight. But even the #8 is only 2 lbs overweight. We recommend you do as we do above and treat each handle with end caps to be 5 lbs so as to create relatively even jumps in weight of 5lb to 5.5lb, instead of trying to match the actual weight perfectly and in doing so create uneven jumps in weight. For more information on this, see our complete guide to assembling pro style dumbbells.